Really interesting flavours that celebrate each component: sloes, gin and rhubarb. Great served chilled with plain yogurt or muesli for your morning breakfast – the alcohol burns off in the oven. If you haven’t got any sloe gin we’re definitely not suggesting you go looking for some just for this recipe. On the other hand if you happen to have some lying around, then it’s definitely worth trying. Heat the oven at 160°C/Gas 3. Cut the rhubarb into short sticks. Put it into a glass, stainless steal or china dish (not aluminium, as it will taint the rhubarb). Stir the sugar, sloe gin and water together and pour over the rhubarb. Bake for 40 minutes to an hour – if the rhubarb is tough it will take the full hour to soften. Keep and eye on it and baste now and then. 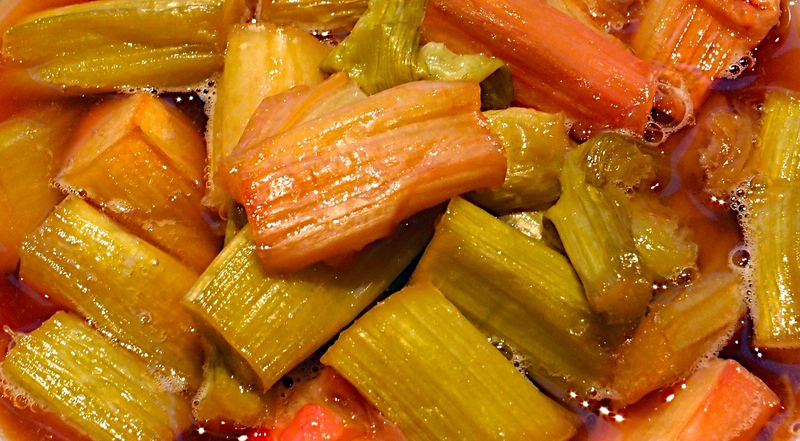 When the rhubarb is tender, remove it from the oven and leave to cool. Can be served warm but we liked it chilled.